Posts Tagged "preschool goal bank"
HomePosts Tagged "preschool goal bank"
I have always found monitoring progress and writing goals for preschoolers with language delays a tricky proposition. How do I get good baseline data with these squirmy little ones? How do I show progress? How do I pick and prioritize goals in children who may be behind in a wide variety of language areas? After struggling with those questions each year especially at progress report time, I decided to come up with a tool to make screening, progress monitoring, and writing goals for my preschoolers easier! The result of that is the Preschool Language – Screening, Progress Monitoring, and Goal Setting Kit. The kit is designed to easily gather information about the language skills of preschool age children or older children with language delays. This information is extremely useful in establishing baseline skills, monitoring progress, and determining areas that may need to be targeted for intervention. 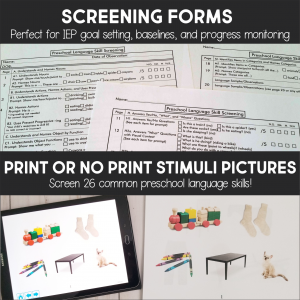 Using the screening pages and stimuli pictures, 26 common language skills that are frequently addressed by speech-language pathologists who work with preschool children can be screened. The screening sheets are very clearly organized and simple to record on. You can also easily pick and choose areas to screen if you only have certain areas of concern. You can see the first page of the screening sheets below. 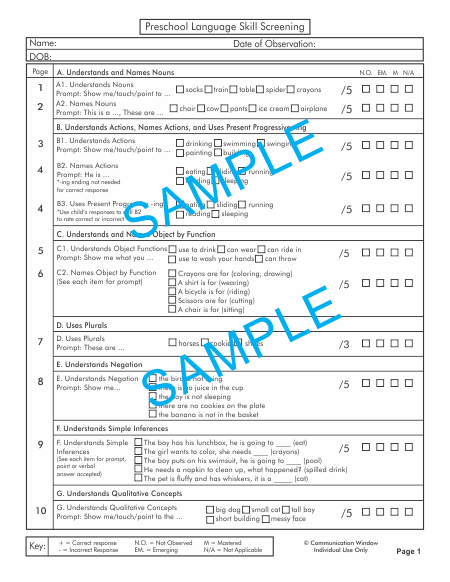 After you have recorded a child’s performance on the screening sheets, you can quickly transfer that information onto the Screening Summary Form and the Progress Monitoring Form. 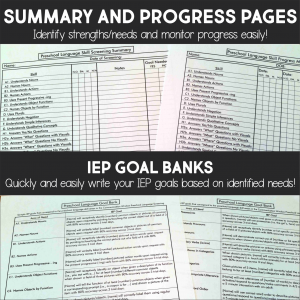 There is also a preschool language skills goal bank that corresponds to all the language areas screened so you can instantly convert the information you gathered to IEP goals for your preschool students! Using the screening kit to quickly gather baseline and progress data saves so much time when I am drowning in a large caseload or scrambling to get progress reports done! I am thrilled with how well it has been received by the SLP community and the amazing feedback the kit gets! 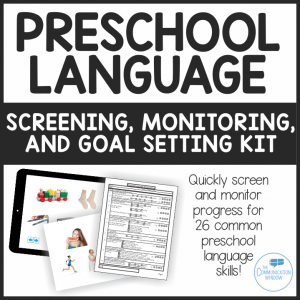 To get the Preschool Language – Screening, Monitoring, and Goal Setting Kit click here!